A powerful new single-axis motion controller enhances Mitsubishi Electric's range of servo drives for machine automation. 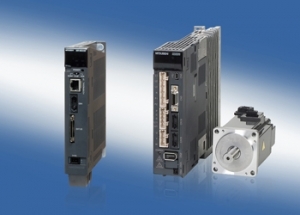 Designed for demanding movement sequences on single-axis systems, the controller supports synchronisation of the drive system with any other processes. It is attractively-priced for many common drive tasks, including, for example, those in the packaging industry. Mitsubishi's new MR-MQ100 motion controller is specially designed for use with the powerful MR-J3-B series servo amplifiers, being capable of controlling the servo amplifier for a single axis at high speeds with great precision. Simultaneously, it can also synchronise movement with an external master encoder or a virtual axis. In addition to point-to-point positioning the controller can be used for complex movement sequences, for which it is equipped with an encoder input, four high-speed digital inputs for registration mark identification and two digital outputs. The compact controller module does not need support from an external programmable logic controller. A control terminal, computer or other control unit can be connected directly to the integrated Ethernet port. The device uses a 24V DC power supply and is connected to the servo amplifier via the high-speed optical SSCNET III (Servo System Controller Network), which supports data rates of up to 50 megabits per second. Bus cycle time is just 0.44ms and plug-and-play installation is quick and easy, with no need for complex configuration. Mitsubishi says the MR-MQ100 and MR-J3-B are perfectly matched for single-axis applications and are complemented by four series of servo motors for a variety of different requirements. All motors are fitted with high-resolution 18-bit encoders that deliver more than 260,000 absolute values per rotation.